A cannonball is fired so that in the first eyeblink of its flight it ascends by N treetops, during the second eyeblink by N-1 treetops, etc until it reaches the highest point of its trajectory. Then it starts falling by 1, 2, etc treetops per eyeblink until it hits the ground. At the same time the cannonball is moving horizontally with a constant velocity of 1 treetop/eyeblink. Your task is to draw the trajectory with consecutive letters from the English alphabet. If you run out of letters, start again from 'A'. Write a function or a program. The input is an integer N (1≤N≤15). The output can be a character matrix in any reasonable form, for instance a newline-separated string or a list of strings. Letters can be all lowercase or all uppercase. Extra leading and trailing spaces are allowed. Standard loopholes are forbidden. Shorter code is better. The corresponding ascii representation of the same program is this. This approach fills in a matrix and then prints the matrix. See @Giuseppe's comment for 112, and some edits for 110 now 109. Rip original code. 1X! % Rotate 90 degrees, so tha tthe parabola is oriented vertically. Motivated by Olivier's comment, I managed to cut multiple reverse calls and apply some general golfing tricks to cut characters. Also I created aliases for reverse, map-indexed, concat, repeat and str because I used them multiple times each. 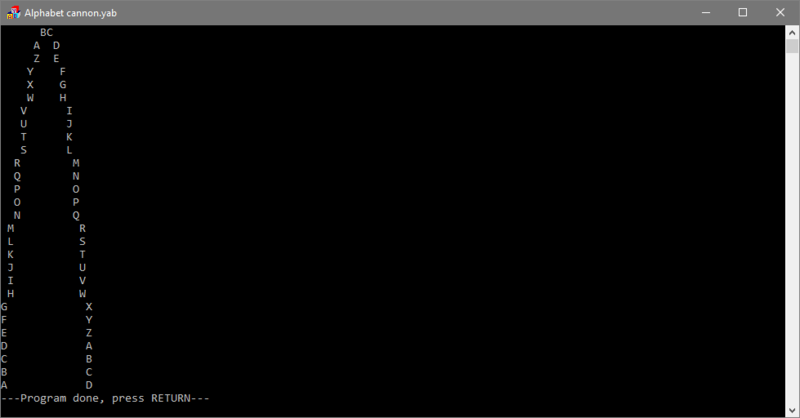 Creates the function c which accepts the value n and returns a list of lines. 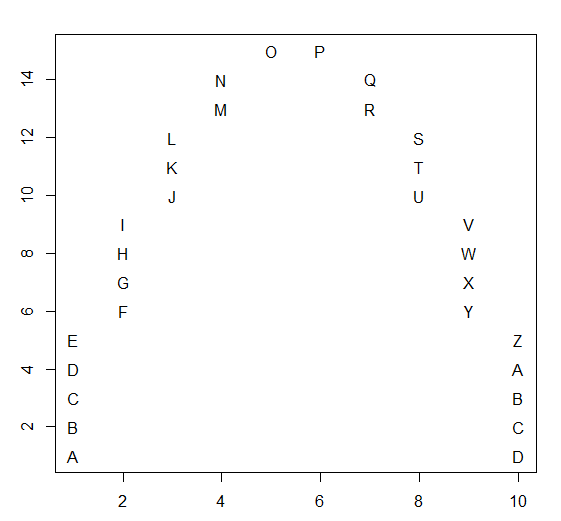 Initialise the current letter as an index into the uppercase alphabet to 0. Make a loop from the negation of the input to the input inclusive. Normally each column is to the right of the previous. However, there is no column for zero. Instead, a correction is needed to ensure that the left and right sides align. Loop for each letter in the column. Move up or down depending on which side of the trajectory we're on. For once the terribly long printf seems to win. int l=n*++n/2,                //    declare l (left) is the first character to print. //              Oh, and n is increased to reduce byte count later. r=l,                      //            r (right) is the second character to print. --l%26+65,                    //    the first character to print is the left one, we decrease it. r++%26+65                     //    the second character to print is the right one, we increase it. This creates an appropriately sized array, finds the indices for the trajectory and assigns the appropriate character to them. The most complex part is generating the characters A-Z, which relies on a very hackish cast of numbers to a string type. 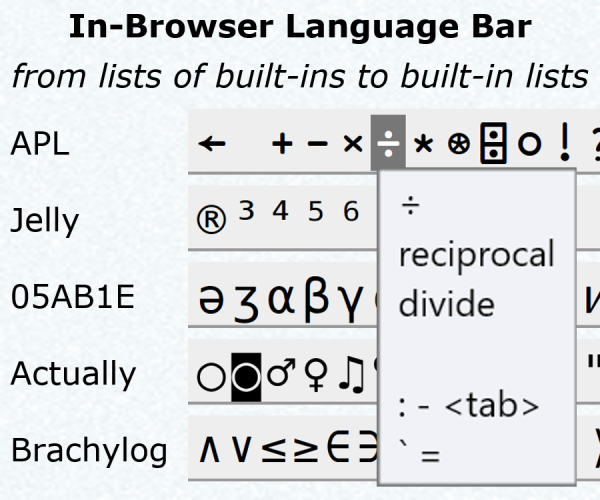 The returned object is a unicode array. Edit: Saved 9 bytes replacing numpy code that generated the characters A-Z ((r_[0:2*N]%26+65).view('U1')[::2]) with map, as suggested here. An basic solution that uses graphics mode to print the characters at the correct column and row of the screen. Because this solution uses graphics mode, it cannot be executed on TIO. Takes input and shoots a cannon. Due to screen size limitations, \$n\$ must be \$\leq 6\$. Not the answer you're looking for? Browse other questions tagged code-golf string ascii-art alphabet or ask your own question.